The Worst Pro Jersey Ever? I love sports uniforms. There is something so amazing in a lot of the design that goes into these things, and there are so many great examples of teams that look absolutely amazing on the field or on the ice. And there are, of course, so many incidents of them going horribly wrong. I can be a bit of a junkie for unis. I have a collection of about 60, across a variety of sports. I also am a loyal follower of uniwatch.com and icethetics.info. Hearing about the upcoming rumors of new jerseys, tweaks and the impressive concepts submitted by dedicated fans. It’s amazing. I love to critique them when they come out, debate their merits, compare them to older versions, pick apart what I like and don’t like. I still have debates at work about the new Team Canada Olympic pyjama jerseys. For all of us uni junkies out there, a new third jersey is always exciting. The anticipation of something new has a certain fun to it. Debating on what it will look like, what the primary colours will be, will they butcher it as they always tend to do with thirds (I’m looking at your latest, Islanders). Oh yeah, don’t forget that the back is a different colour. I think a lot of people thought it was a joke, but now that the team has finally started wearing this abomination on the ice, in actual professional hockey games, I guess we have to look at it in the pantheon of all-time terrible hockey uniforms. Giving a lot of the accidents that happened in the 90’s, such as the Kings Burger King uniform, or the brutal Blues thirds that Mike Keenan refused to have his team wear, or the incredible Wild Wing uniform out in Anaheim, the new Buffalo Sabres jersey has to be considered one of the worst ever. This is awful. 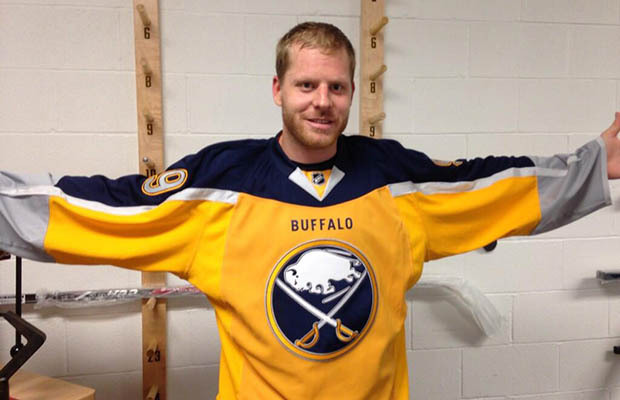 I like the idea of a yellow Sabres jersey. But there is so much wrong here, it’s almost hard to make the list. Two shades of yellow. Ridiculous white piping that doesn’t go all the way down. A wrist area that looks like it was wrapped in duct tape. The absolutely, completely unnecessary “Buffalo” wordmark above the emblem. The mishmash of colours around the collar. And maybe the potentially most interesting idea, but yet another flub on this mess: the different colour on the back (it is dark blue, the same as on the shoulders). Disaster. The people who made this, and even worse, those who approved it, should no longer have jobs. The Sabres thirds are an ugly joke. Much like their season, so I guess it is all pretty fitting. I love when new unis come out. Especially when they are such easy targets, as this one is. I have yet to talk to someone who thinks they are nice. I wonder how the sales are? I can definitely see that they will have some kitsch value down the road. Much like the now, sort-of-beloved-but-still-really-hated Islanders fisherman jerseys. I would kill for one of those. I had to debate a fair amount if I should get tickets to Black Sabbath or not. I am still a bit of a metal head, and love that these classic bands are still doing the rounds. I have to say that I was impressed with their latest album, 13, which still maintains a lot of the feel of their old music. But still I wondered if I should spend the money to go, plus endure the inconvenience of having to ever attend something at Rexall Place. The largest decision was weighing my dislike for Ozzy Osbourne with the fact that we may never get the chance to see this band again. 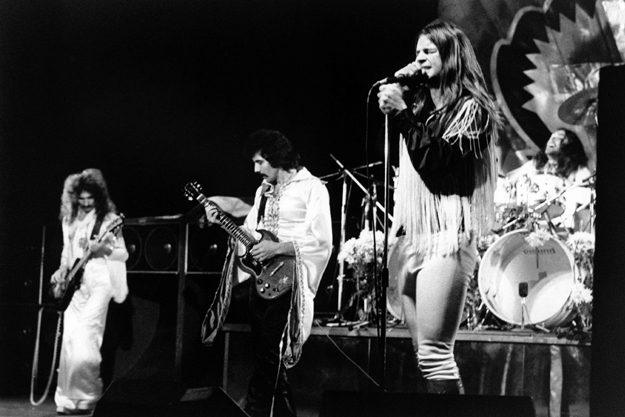 I was never a fan of Ozzy’s solo career, and his voice is far and away the worst thing about Sabbath, in my opinion. Yes, he gave personality to the band, and he is definitely an iconic frontman, but I never really got on board with his voice or his consistent, follow-the-guitar, vocal rhythms. Plus, the fact that he ended up being little more than a reality show cartoon character really turned me off of him. But, let’s be honest. This is Black Sabbath. A pioneer band, without whom we would not have seen so many great metal acts follow in their footsteps. They may never tour again, so I am glad to get a piece of it while I can. Now, I just need to keep my fingers crossed, as they already have been since I developed a taste in music, that there will someday, somehow be a Led Zeppelin reunion tour. Ok, ok, calm yourselves Oilers fans. You’ve won two games in a row now, and it isn’t quite time to go pick out the best spot along Jasper Ave. for the Cup parade. Two wins in a row is nice, especially after a long drought and a pretty brutal month of hockey. But there really isn’t much to celebrate here. Two wins in a row. The Calgary Flames had a nice start to the year, but there is no fooling anybody that they are a decent team. Since their hot start, they have been taking the plunge towards the bottom of the league, where everybody expected them to be in the first place. They are such a miserable mess, that there are probably several players in that dressing room that can’t even name their own starting goalie. The rebuild is full-on in Calgary. The Columbus Blue Jackets are…well, they’re the Blue Jackets. If ever there has been an NHL team that is cursed, it is this sad-sack organization, one that still has yet to win a playoff game in their entire existence. Injuries are mounting, and they are not a good team, even with a move to the far easier Eastern Conference. Like most people predicted, the BJ’s goalie, Sergei Bobrovsky, has fallen back to earth after his exciting and unexpected Vezina season last year. Nobody is under any illusions that the BJs are a good team. There were some good things for the Oilers last night. Scoring seven is always a good thing. But this is barely NHL competition they are facing right now. Get some wins against some real teams, put together a bit of a run against some of the many, many teams they are already chasing for a playoff spot, and then we can talk. Until then, it is just a slight boost of morale for a dejected fan base. A reason to say some good things about the team on the radio for the first time in a long time. It seems every year this team will put together a nice little five game win streak that gets everybody overly excited, before they end up falling flat on their faces once again. With the dismal Florida Panthers up next, I can see them push this to three in a row…get those overly heightened expectations up! It feels like I have been waiting a long time to write this post. Maybe even one of the reasons I started this blog was to write this post. And I know that when I am done, I will feel like it is woefully incomplete. I love The Great Gatsby. It is my all-time favorite novel. Since the first time I read it in my first year of college, I have felt an attachment to the story. Someone so haunted by their past, so faithful to the idea of the green light, so hopeful that things can be the same as they were. It is beautifully written, perfectly romantic, and wonderfully simple. It really is the greatest example of American literature that we have. I have read and re-read it, studied it and taught it in the classroom. It is the first book I will recommend to anyone looking for something good to read, regardless of the person. Millions have poured over Fitzgerald’s words already, and I hope that millions more will. The Great Gatsby is one of those novels that should never die, and never fade away. There is no more perfect explanation of the American Dream, and no more perfect commentary on its failures than in this book. So, naturally, I was excitedly terrified when the new film came out. Maybe one of the reasons I waited so long to try and write a review or comment about it, is because I wanted to digest it. I have now seen the DiCaprio film version three times, and I only now have some concrete thoughts on the movie. I could go into details about plot changes, but I just want to highlight some of my pros and cons of the film. For people who know Gatsby, they already know the manipulations undertaken to take this work of art to the big screen (again). + This film version is essentially two films. 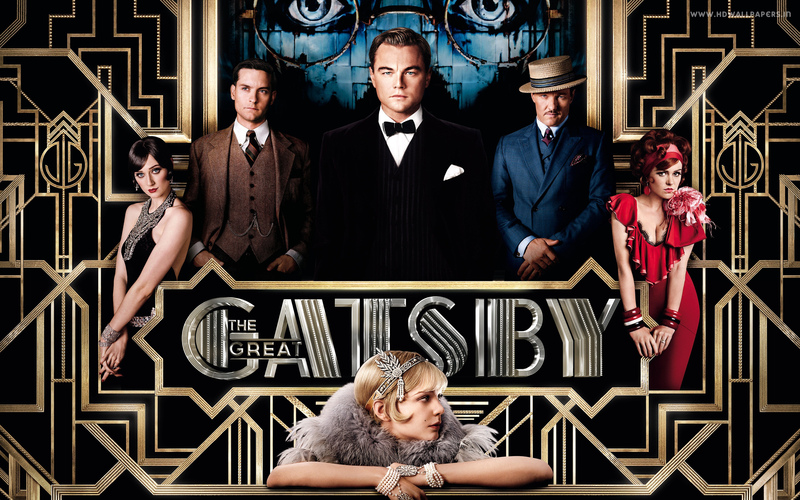 The first half illustrates Baz Luhrmann’s reckless direction and love of in-your-face, over-the-top, visuals. But is works. Sort of. Aside from the cartoonish scenes with the cars, the garish and decadence behavior of the 1920’s lends itself perfectly to his style. He seems to demand nearly hammy performances from his actors, and he gets it from them. For the second half, he reins himself in and manages to tell a tender love story, where the eyes of the viewer are drawn to the character, and not the impressively high confetti budget. – This movie is a waste of 3D (for those who saw it in the theatre). Yes, the party scenes were cool, but aside from that, I wished I had seen it in good, old fashioned, 2D. Wearing the stupid glasses on top of my glasses was not worth the couple of scenes where it was visually interesting. + The casting for this film was sound. DiCaprio was the perfect choice as the titular character (can you really think of anyone else who should have played this role? ), partially because DiCaprio is very much a real-life Gatsby. Daisy, Tom, Myrtle, George, and Jordan were all physically perfect for the film, and they could act as well, which helps. -Tobey Maguire was very hit and miss as Nick Carraway. He plays the nerdy third-wheel well, but I wonder if there could have been a more capable actor, that could have brought some guts to Nick, to make him a more loveable character, instead of one who we feel is being used over the course of the entire film. This film adaptation embraces the idea of Nick as a watcher an enabler, when there is more substance to his character, in my opinion. + Jordan Baker is my favorite character in the novel, and she was as well in the movie. 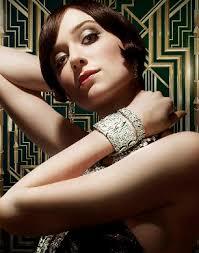 And not only because she is played by an absolutely beautiful Glamazon of an actress (Elizabeth Debicki). At 6’2 1/2″, she towered over her co-stars, but she also humanized Jordan a little bit more than she is in the novel. She is not an awful, dishonest, person, but one who believes in the love story that Daisy and Gatsby shared. I like Jordan because she is beautiful, selfish and kind of evil. She came across perfectly in this movie. And wow, absolutely stunningly beautiful. – I hated that Nick was in a sanitarium in the film. He doesn’t need this made up excuse to be telling the story of his former neighbor. I thought that was a weak choice, as it spoonfed the audience too much and also crippled our views of Nick as being a reliable narrator. – Too much narration crippled some of the performances in the film. When you have strong actors like Carey Mulligan and Leonardo DiCaprio, let them act. It was unnecessary that so many of their scenes were spoken over by Maguire. I understand that there are so many beautiful lines in the novel that they didn’t want to leave out, but I felt that it was overkill. – According to IMDB, the phrase “Old Sport” was uttered 55 times in the film. That is a lot. Tone it down, as it lost some of its effect. I know that they use it often in the novel as well, but at times it seemed like every line Gatsby said ended with his catchphrase. – The funeral was a huge miss on the part of the screen writers and director. One of the saddest parts in American literature is the fact that nobody went to Jay Gatsby’s funeral aside from his own father and Owl Eyes. That he was the most famous person on Long Island, a man surrounded by mystery and excitement, and nobody would come to say their final goodbyes is the most gut-wrenching part of the novel. And they blew it in the movie. Having the media there ruined the sadness of the moment, and we never even saw Owl Eyes there, to utter his disbelief that people used to show up at his house by the hundreds and couldn’t make it out for his final appearance. The narration Nick provides over this moment is lost in the visuals of dozens of reporters and flashbulbs looking over Gatsby’s body. Definitely the biggest missed opportunity of the film. + The scene where Nick pays Gatsby his only compliment was perfect. The look on Gatsby’s face was one of pure happiness and understanding, perhaps the last moment of that in his life. Luhrmann kept this simple, and it worked wonderfully. I could probably go into far too much detail on what I liked and didn’t like about this movie. Overall, I would say that I wanted to love it, and despite the parts that I hated, ended up liking it. This is definitely a valued addition to the Gatsby collection of adaptations. Despite being both helped and hindered by an eccentric filmmaker, the strong cast bring my overall view of this movie into the plus side. And now that I have pretty much finished writing this post, I realize that there are a million other things I would like to add. But I will leave it here. The Great Gatsby is a million miles from being perfect, but I don’t think that it is possible to adapt a text that is so famous and so beloved into something that everybody will love. This version gave it a shot. And for the most part, succeeded. Just like everybody else on this planet, just a few random things that I like to ramble about on occasion. Keeps me busy, not that I’m not busy enough already, but whatever. Every now and then I feel like getting something down, and like too many other people, I have become too lazy to use a pen and paper. Besides, this way, everyone will have the chance to share in my wonderful opinions!